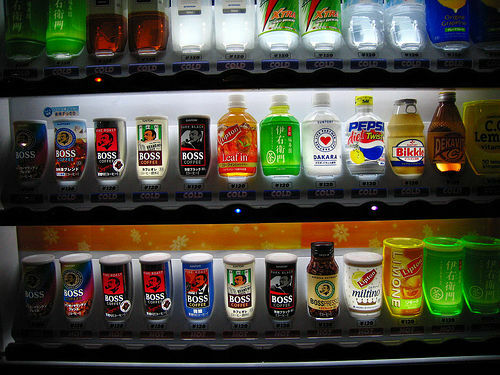 Japan is known as the land of the rising sun… and the land of vending machines. There are over 5.4 million vending machines as of Dec 2007 in Japan alone. However, with going green becoming a worldwide trend, how much of a carbon footprint are those vending machines leaving? The mayor of Ikoma City, Makoto Yamashita, has stood up and is determined to do something about it. While there are only 39 cigarette and drink machines in Ikoma, the city plans to get rid of as many of them as possible. While they plan on keeping the essential vending machines, such as sports drinks at the gym, Ikoma City will install more modern and energy efficient vending machines. This is not Ikoma City’s first time dealing with a greener city. In 2001, they held a successful campaign dedicated to reducing wasteful energy by switching off lights and air conditioners when not in use. Now if Tokyo would follow suit, Japan would be well on its way to becoming a greener country.